When the going gets tough, the tough get… more relief from a placebo? ANN ARBOR, Mich. — Are you good at coping when life gets tough? Do people call you a straight-shooter? Will you help others without expecting anything in return? Those personality traits might do more than help you win a popularity contest. According to new University of Michigan-led neuroscience research, those qualities also might make you more likely to get pain relief from a placebo – a fake medicine. And, the researchers show, it’s not just your mind telling you the sham drug is working or not. Your brain’s own natural painkiller chemicals may actually respond to the pain differently depending on your personality. If you’re more of an angry, hostile type, they find, a placebo won’t do much for you. For the first time, the new findings link specific, established personality traits with an individual’s susceptibility to the placebo effect from a sham medicine for pain. The researchers showed a significant link between certain personality traits and how much relief people said they felt when given the placebo – as well as the level of a specific chemical that their brains released. 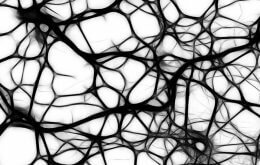 The work, published online today in the journal Neuropsychopharmacology, was done by a team of U-M Medical School researchers and their colleagues at the University of North Carolina and University of Maryland. The results build on nearly a decade’s worth of work on the placebo effect by the team led by Jon-Kar Zubieta, M.D., Ph.D., the Phil Jenkins Professor of Depression in the U-M Department of Psychiatry, a professor in the Department of Radiology and a member of the Molecular and Behavioral Neuroscience Institute. The findings show that about one-quarter of placebo response was explained by the personality traits of resiliency, straightforwardness, altruism or anger/hostility, as measured on standardized tests. 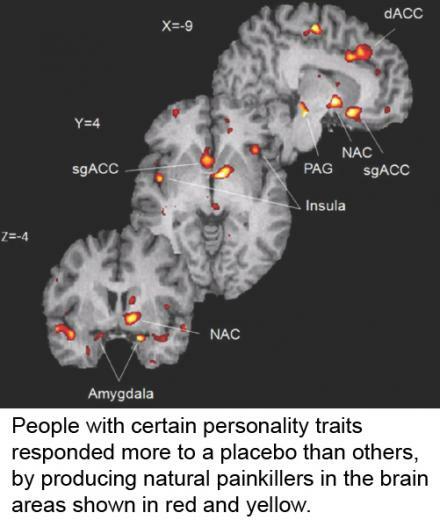 Other personality traits didn’t appear to be linked to placebo response. The new results come from a few dozen healthy volunteers, so the experiment must be repeated in larger, more diverse groups to be confirmed. If confirmed, the findings could help researchers who study new drugs and other treatments – a field where placebo responses can really muddy the results and make it unclear whether the real therapy is working. Perhaps one day researchers will be able to adjust their results to account for the individual placebo responses of volunteers in their clinical trials. Zubieta notes that the new findings came from a study involving pain, but that it may also apply to how personality influences a person’s response to other stress-inducing circumstances. He and his team, including first author, former MBNI postdoctoral fellow and now psychiatry research investigator Marta Peciña, M.D., Ph.D., hope to continue the research in people with depression, and to continue to explore how genetics as well as personality influence placebo response. He notes that the findings may even have implications for the doctor-patient relationship – for instance, patients who have certain personality traits and placebo-response tendencies may also be more likely to partner with their doctors on their care, and discuss frankly any concerns they have about their response to treatment. The researchers conducted the study among nearly 50 healthy volunteers, both male and female, between the ages of 19 and 38. They gave each person a battery of standard psychological tests that help identify the strongest personality traits an individual has, and then had them lie down in a brain scanner called a positron emission tomography or PET machine. They told the volunteers that they were going to experience pain from salt water injected into their jaw muscle, and that a painkiller – actually, a placebo – would be injected at certain times. They asked patients to rate how much relief they expected to get before the experiment began. Then, during the 20-minute period when volunteers received salt water and/or “painkiller”, they asked them repeatedly to say how effective they though the painkiller was. Meanwhile, the PET scanner made images of volunteers’ brains, allowing the researchers to see how much of the natural painkillers called endogenous opioids , were released in certain areas of each person’s brain under painful or “painkiller” conditions. They also drew blood from some of the patients during the experiment, and measured levels of a stress-induced chemical called cortisol. After the tests, the researchers performed sophisticated statistical analysis to determine how personality traits influenced pain ratings, brain chemical response and cortisol levels. Although the cortisol levels did not seem to be influenced by personality traits and the placebo effect, the endogenous opioid activation elicited by the placebo, as well as patient-rated pain intensity levels, were. In addition to Zubieta and Peciña, the team included Hamdan Azhar, M.S. and Tingting Lu, M.S., of MBNI and the U-M School of Public Health’s Biostatistics program, MBNI research investigator Tiffany M. Love, Ph.D., Barbara L. Fredrickson, Ph.D. of UNC, and Christian S. Stohler, D.M.D. of U. Maryland. The research was supported by grants from the National Institutes of Health, including AT001415, DA016423 and DA022520, and by the Phil F. Jenkins Foundation. The team needs volunteers for other studies; visit www.umclinicalstudies.org & search for Zubieta.